Tomorrow I'll be picking up & bringing our apparel to class. If you forgot to order, I will have some extra t-shirts available ($10/each) in both child & adult sizes. Also, Saturday is when we're hosting our yearly tournament (Muskego Melee) which is our biggest fundraiser for the club. Please spread the word to family, friends, neighbors, etc. to stop by and help support us. If you haven't registered, the link is http://ia-chess.com/registration/tournamentinfo.html?id=50. It's a great first tournament. The sections are K6 unrated, K3, K6 & K12. If you have any questions as to what section to sign up for, feel free to ask any of us tomorrow night. Also, we're on FB as well. 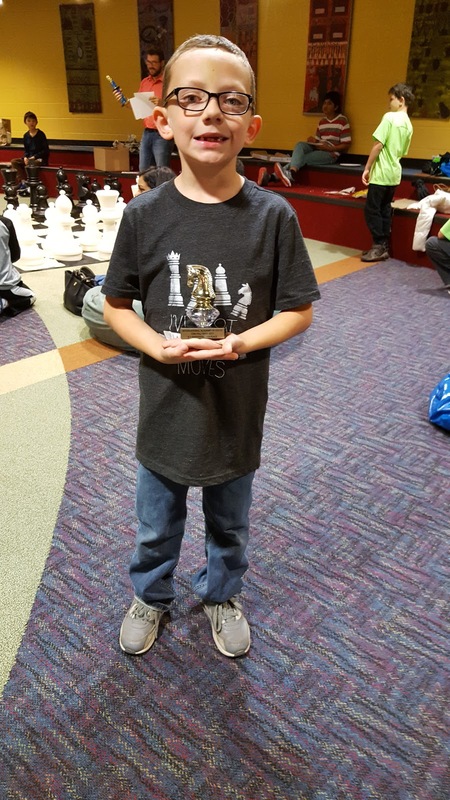 The group's called "Muskego Scholastic Chess Club." Just a reminder that there won't be chess tomorrow night, November 21 & we'll resume November 29. I will also have the apparel on the 29th. I ordered a couple extra t-shirts (both adult & child size) in case anyone forgot to order. They're $10/each. Have a wonderful Thanksgiving & don't forget to practice chess! Hope you had a nice weekend! While we were at the USM tournament yesterday, we did a little of our own tournament planning. Can you believe it's less that two weeks away?! Our tournament at LDMS on December 2nd is our biggest fundraiser of the year and is also a nice way to involve more of our club while having fun! But we cannot run this tournament without you! Please sign up (thanks Karla Klein) to help set up Friday night, run the concessions during the day on Saturday, or cleanup when it's (almost) over. If you have any questions at all please let me know! The first tournament of the season was a challenge. There were some players in a new section, a tad rusty or even in one case, this was his first tournament ever played but nonetheless, the team made us proud with their attitudes & efforts. Anthony had 3 wins & placed in 6th. Congrats! Nate ended with 3 wins & ended in 10th. Congrats! Both Logan & Rishi ended with 2 points. This was Rishi's first tournament playing in the K6 Section. Alyssa ended with 3 points which placed her in 10th. Congrats! Adam had 1.5 points, Aaron ended with 2, Will with 2.5, Steven 2 points & Elijah with 1 point. This was Steven's first tournament playing in the K12 & Elijah's first tournament ever played. Next week we're having a pizza party at 6 pm. This is open to the chess players & their families. We (MSCC) asks for a $5 donation per person & that everyone starts out with no more than 2 slices at first just to make sure everyone gets some. If you're willing to bring something like soda, cookies, etc please let me know.